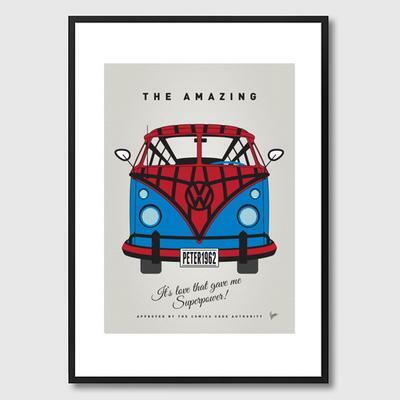 This My Superhero VW Spiderman Framed Print is made for everyone who loves spiderman. It's made by Chungkong and part of the superhero VW collection. This particular piece features a VW with Spiderman's signature costume. It's printed on high quality paper, matted and then framed under wood. There's also a title included and a cool homage license plate that reads PETER1962. The print is available in two different sizes so you can pick one that matches your walls or interiors. The print is great as a gift for a friend or family member. It's printed on quality paper and under shatter proof perspex so it's going to last for a long time.